Mat Gamel tore the anterior cruciate ligament in his right knee for the second time in less than a year and will miss the season. 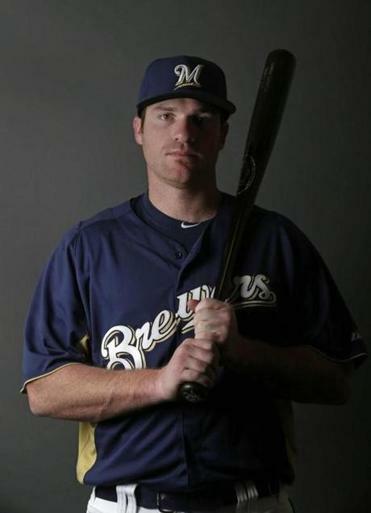 The Brewers were counting on Mat Gamel to help fill the offensive void left by Prince Fielder’s departure following the 2011 season. Now Milwaukee will be without the first baseman for the second straight year. Gamel tore the anterior cruciate ligament in his right knee for the second time in less than a year and will miss the season. The 27-year-old was lost for the 2012 season after just 21 games. Gamel’s knee checked out fine in late January in Milwaukee and again during a spring training physical on Feb. 12. But Gamel reinjured the knee Saturday during the Brewers’ first full-squad workout, and an MRI Sunday revealed the extent of the injury. Gamel has been restricted to 106 games in the majors since his debut in 2008, mostly because of injuries, including a torn muscle in his right shoulder in March 2010 and a strained right oblique in February 2011. He was expected to be the Brewers’ first baseman in 2012 coming off a season in which he hit .310 with 28 home runs and 96 RBIs in Triple A.
Corey Hart, who moved to first base after Gamel’s injury last year, is on crutches after right knee surgery Jan. 25 and is expected to be out 3-4 months. Roenicke said candidates to play first until Hart returns include shortstop Alex Gonzalez and Hunter Morris, the Brewers’ minor league player of the year last season at Double A.
Milwaukee might also be in play for Mike Carp, the first baseman/outfielder who was designated for assignment by the Mariners last week. Cubs righthander Matt Garza will undergo tests to determine the severity of the lat strain he sustained while pitching batting practice Sunday. The Cubs called it a ‘‘mild strain’’ but general manager Jed Hoyer said Monday that Garza will undergo an MRI and receive a ‘‘rest period.’’ Garza went 5-7 with a 3.91 ERA last year. He made his final start on July 21, when he left a game in St. Louis because of a stress reaction in his elbow . . . The Cubs traded outfielder Tony Campana to the Diamondbacks for two 17-year-old pitchers. Campana was designated for assignment last week.